The heat treatment furnaces are a particular type of machine that has the purpose of hardening the surfaces of stainless steel and other materials. The process made with the heat treatment furnaces is called nitriding and nitrocarburizing, and forms part of the processes normally made by the industrial furnaces. Heat treatment furnaces allow a hardening that can be obtained with the heat. The material is placed inside the oven, where the temperatures progressively reaches up to 520°C. The consequence of the reaching of this temperature is the creation of atomic nitrogen, that has the ability of “attack” the ferrite, that is the surface of the material. Generally, the elements that undergo through this process are very resistant, so steel with chromium, molybdenium and aluminium are often used. In turn, the ferrite that matches with the nitrogen creates nitrides along the surface, creating a protection layer very strong and resistant. The principle on which it is based is the one of the precipitations and not the martensitic transformation. The process performed with the heat treatment furnaces carries a series of benefits, among which corrosion, grooves and other kind of subsequent works resistance, and friction reduction. The duration of the process inside the heat treatment furnaces can be variable, depending on the thickness of the material and the layer of nitrides to be obtained. It is, in every, a long procedure, unlike the tempering. The process of nitriding and nitrocarburizing are fundamental steps performed inside the heat treatment furnaces. With this process, in contrast with the tempering, the deformation is at its minimum. In order to reach a better result, the surfaces should be properly washed and defatted in a previous moment, in order to remove every type of remaining. Subsequently, instead, no more steps of works are required. 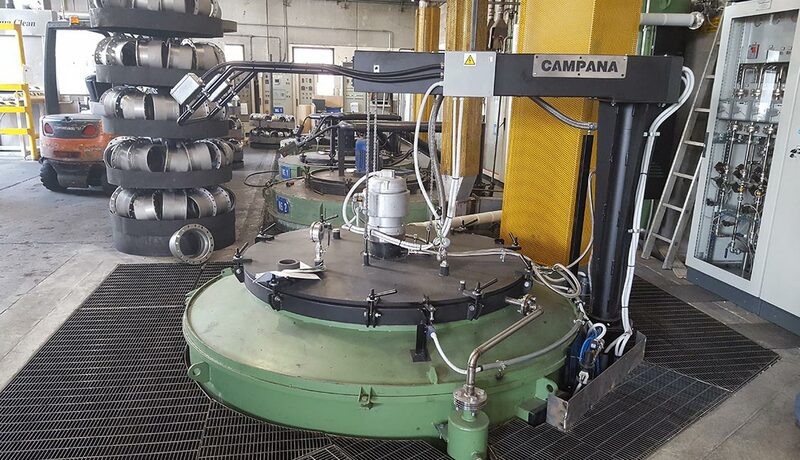 Campana produces heat treatment furnaces that respect all the guidelines of this field, such as the Circular 4E of the 03/30/2017, that plans incentives for the digitalization of a business. Thanks to the various possibilities of customization, the heat treatment furnaces can be easily included inside a well-arranged production line.